Last Wednesday, following my weekly Rotary meeting, I had some time to spare. Feeling in the mood for a bit of ancient history, I made the short walk to the Kelsey Museum of Archaeology. This is one of the oldest museums in the University of Michigan cultural pantheon, and like other University departments, it is a teaching facility. Founded in the 1920s by Latin professor Francis W. Kelsey, the museum, a stunning example of the Richardsonian Romanesque, houses thousands of artifacts recovered by UM archaeological expeditions. I have had the pleasure of welcoming the Kelsey’s directors and curators many times on Speaking of Art, usually to highlight a new exhibition. In this case there wasn’t a new exhibition to see. In fact, the recent Death Dogs of the Nile show was being dismantled. I knew where I was going. Up the staircase to the second floor, to the Greco-Roman galleries, and into the hushed presence of Rome’s first emperor, who reigned from 27 BC (now BCE: Before the Common Era) to 14 AD (now CE). Born of the late Roman Republic’s political shift from senatorial oligarchy to rule by popular strongmen — dictators — the Empire was a compromise between the traditional landed aristocracy and the reality of a Rome that had grown far beyond its Italian homeland. The army, bloated from the civil wars of Marius, Sulla, and Julius Caesar, was now professional, permanent, and expensive. Simply put, an oligarchy scrounging for money to keep the legions and their ambitious generals from running amok would no longer work. The compromise — legitimized dictatorship cloaked in Republican formalities. Augustus’ legerdemain would establish an empire more or less at peace for 200 years. The marble portrait is a formidable one. Augustus maintains a youthful blush, but the hardening of the practical politician has begun to set. By the time the anonymous sculptor carved this image, the features of the monarch had been generalized into a formula: youthful, confident face in the Grecian manner (which Augustus himself preferred); locks of wavy hair forming a kind of part, or cleft, above the right eye; the face broad at the forehead, then gently tapering to the chin; the ears small and slightly flared. The overall effect is one of magisterial dignity and calm, with practically no glimpse of personality. It is an iconic image, devoid of stress; the face of a man-god. Later emperors would refine this placid detachment into an almost Eastern abstraction, culminating in Constantine’s upward gaze, no longer leveled at his troops or subjects; in communion with no one but God. What makes the Kelsey’s Augustus so interesting, however, is how it deviates from the orthodoxy. It is not a mere facsimile of the intact Prima Porta statue in The Vatican Collections, usually cited as the standard image of the emperor. Using the movie Toy Story II as analogy, it’s as if Buzz Lightyear, in the scene when he confronts the reality of his own duplication — hundreds of Buzzes in boxes on the toy store’s shelves — were to notice one that is markedly distinct. For the Kelsey’s Augustus is not the personality-scrubbed Imperator, reconciling the civil wars with Rome’s new glory, but a prince in the Machiavellian mold, an author of proscription lists, a man capable of exiling his own daughter and grandson to the barren Pontine Islands. 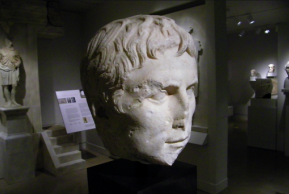 After his sudden death at 76 in 14 CE, Augustus was deified by his adopted son and successor, Tiberius, thus securing both the dynasty and the Empire for the foreseeable future. Temples were erected from the cities to the frontier, and, according to Robert Graves, even beyond. As to the face of kingship? The Kelsey Augustus evokes a majestic image of Imperial Rome’s founding father, but one that chillingly heralds the totalitarian despots of more recent times.